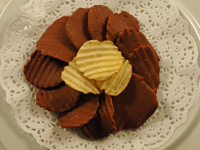 Amazing chocolate covered potato chips! From Anonymous of Springfield, Illinois on 12/20/2018 . From David O of Quincy, Massachusetts on 4/9/2017 .